“Rodong Sinmun” . Lista delle partite (16-22/03/2014). Posted in Senza categoria and tagged dpr korea league on marzo 31, 2014 by calciocorea. Kuala Lumpur: The journey to be crowned the next champions of the AFC President’s Cup began at AFC House on Friday with the draw for the 2014 tournament and with no previous champions and six debutants including the first participation from a North Korean club the tenth edition of the popular tournament promises to be one of the most exciting yet. For only the second time in the history of the AFC President’s Cup a former champion is not taking part, with three-time participants and last year’s runners-up KRL (Khan Research Laboratories) going into May’s Group Stage as the most experienced side in the fray. KRL, who lost 1-0 to Turkmenistan’s FK Balkan in the 2013 AFC President’s Cup final in Malacca last September, have been drawn in Group A in an intriguing all South Asian pool. Joining the Pakistan powerhouse are group hosts Sri Lanka Air Force SC, Sheikh Russel Krira Chakara Limited from Bangladesh and Ugyen Academy, who edged undefeated Yeedzin by a single point to win the 2013 Bhutan National League ahead of the two-time AFC President’s Cup participants. Sheikh Russel, Ugyen Academy and Group A hosts Sri Lanka Air Force SC are all making their competition debuts as are Rimyongsu, who are making tournament history by becoming the first club from DPR Korea to take part in the AFC President’s Cup. The Sariwon-based outfit have been given a tough assignment in their mission to go a step further than compatriots April 25, reached the semi-finals of the 1990/91 Asian Club Championship in Bangladesh, and become the first North Korean side to claim continental club silverware. Rimyongsu have been drawn in Group B with former AFC President’s Cup semi-finalists FC HTTU from Turkmenistan and Chinese Taipei’s Tatung, who reached the last four in 2010 and 2006 respectively, and hosts Ceres – La Salle, who will be hoping to make home advantage count in their debut campaign. Another team looking for home field advantage to give them the edge is 2010 semi-finalists Erchim. The eight-time Mongolian league champions will host three-team Group C that also features AFC President’s Cup newcomers Svayrieng, the Cambodian league champions who were previously known as Preah Khan Reach, and Nepal league winners Manang Marshyangdi, who are returning to the tournament for the second time after taking part in the 2006 edition of the tournament. Posted in Senza categoria on marzo 28, 2014 by calciocorea. Posted in Senza categoria on marzo 27, 2014 by calciocorea. Gol di tacco per Pak Kwang-Ryong nel 2-2 tra Wil e Vaduz FC (derby con Cha Jong-Hyak). Posted in Senza categoria on marzo 23, 2014 by calciocorea. Sconfitta netta nella prima giornata del Mondiale femminile under-17. contro il Ghana è 2-0: decidono, con una rete per tempo, Ayieyam (16′) e Owusu Ansah (50′). Posted in Senza categoria on marzo 16, 2014 by calciocorea. Posted in Senza categoria on marzo 14, 2014 by calciocorea. 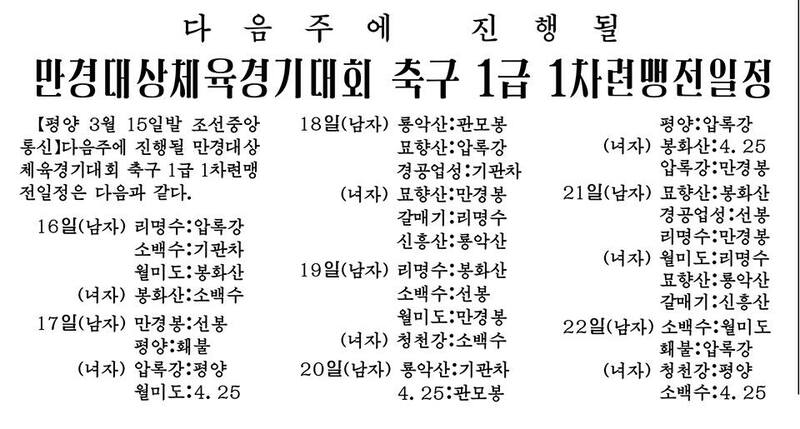 Pyongyang, March 10 (KCNA) — The first round of the premier soccer league matches has begun Monday as part of the Mangyongdae Prize Sports Games. 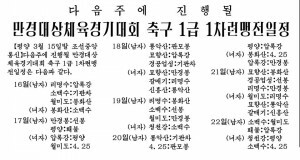 15 men’s soccer teams and 14 women’s teams are competing in league matches, which will run from March 10 till late in April at Kim Il Sung Stadium, etc. Doppietta per Pak Kwang-Ryong nella vittoria per 5-2 tra Vaduz e Chiasso. Posted in Senza categoria and tagged pak kwang ryong on marzo 10, 2014 by calciocorea.